Ok, there’s gotta be a reason he chose this song. Maybe the site will be getting re-vamped? I think he is just sensing the destruction of Alderaan? so is this site like some guy’s low-rent version of robot chicken? Well… Robot Chicken actually uses animation and as you can see, that picture up there isn’t moving. So if that makes me “low-rent” then I guess I’m “low-rent”. I must admit, I’m pretty sure I don’t have the budget Seth Green has. If you can do better, please show me. I’d love to see your stuff. On another note, I find it odd that to date, six “different” people have posted comments with your IP address. We have a Ginny, thomas_bubonic, Jerry, gringobastard, G Jones, and now a Hilda. I suppose these could be coming from a public or work computer that six “different” people just happen to come across my page and felt the need to leave comments, or…. you could possibly be suffering from a mild identity crisis my friend. Don’t let the hater(s) get you down, Niktom. I love your stuff! As for the _Robot Chicken_ comparison, the only similarity I see is you both use action figures to do funny stuff. But so what? There’s plenty of room for you, and RC, and other “action figure Web comics” and stuff. Sorry if I did sound childish with the explanation above. It was meant for the anonymous there. As for the comparison with Robot Chicken – as Fish eye said – don’t pay attention to these comments. Your strip is still great after more than 2 years EVERY WEEK DAY, so you have something to be proud of here 🙂 My only wish was you put this sketch as a weekend special, those are great! Keep up the good work! This was originally planned as part of Talent Night 4… which of course has yet to be made along with Talent Night 3. I’m just not sure if either will get made any time soon 😦 , so this is a trial run of sorts to see how well the ideas transfer over to the regular strip. It seems to me that you have been doing this strip long before Robot Chicken did anything with Star Wars (I could be wrong, but I never heard of Robot Chicken before their SW special). And I enjoy your strip more. Thanks DarthMac, but Robot Chicken was actually around before I started. The first episode aired 2-20-05. I was exposed to it on YouTube when a friend sent me a link to the skit about Vader calling Palps after the Death Star’s demise. The episode which contained that one aired 5-7-06 titled “1987”. 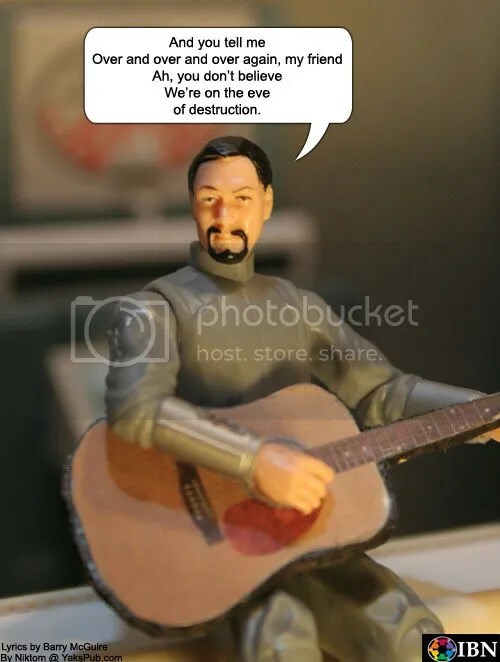 However, the link was sent to me sometime after I had started posting my pics (Sept. 2006) in the YakFace forums because they mentioned how similar my humor was to Robot Chicken’s. Of course after watching that single skit I was hooked. I’ve always thought of my stuff being more similar to Twisted Toy Fair Theater. I love that stuff! I mean, seriously… I’m not the first person to take pictures of toys and make comics out of them… nor do I claim to be. When we met in person I compared your work to robot Chicken only in the sence that it was satire with toys in an adult humor manner. And honestly I hadn’t heard of Yak’s pub before I saw your booth. Now I’m a big fan who tells anyone who I think will get a kick out of it. Keep up the good work and screw the haters. Snerts are everywhere…oh yeah and just b/c you read it on the internet, dosent make it true.